As Christmas rapidly approaches, I took the time from my ‘about to get busy schedule’ to read Skipping Christmas by John Grisham. Many of you may already know this story as it was made into a movie called Christmas with the Kranks not too long ago. The movie was a carbon copy of the book, but I enjoyed it anyway. Every year I begin the holiday season with a degree of dread. Like the Kranks, I can in some respects imagine how nice it might be to forego the holiday crazies. Christmas is always preceded by a month filled with so many tasks that it is easy to lose sight of the reason we celebrate it. Come Christmas Eve each year, when I gather with my family, all of the hustle and bustle quickly fades and is replaced by a glow that comes on the faces of the loved ones who surround the gift laden tree with the look of an excited youngster on their faces resurrected from earlier days when Santa brought surprise treasures to be torn open. As the Kranks discover in this book, Christmas is a holiday not to be skipped. It is a short, funny book with a tender moment ending. I am happy Grisham wrote it because I enjoyed it. 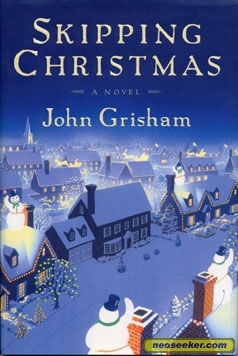 This entry was posted in Uncategorized and tagged Books, holidays, John Grisham, Skipping Christmas. Bookmark the permalink. | Thankyou for all your efforts that you have put in this. very interesting information.